Bitcoin neural network analysis week 13/2019: WTF is this? The network expected that we stay in the low 4000$'s and drop down towards the end of the week. This was a quite accurate description of the week. The network strategy was ideal. The fiat strategy is up since the documented time has been a bear market. The neural network has gotten some edge above holding bitcoin. 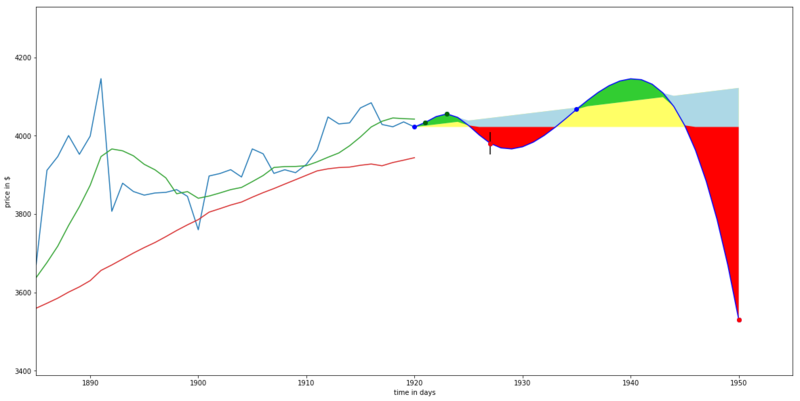 Red areas are predicted below the current price, blue/yellow areas indicate the expected passive growth, green areas are better than the expected growth. The vertical line is one week into the future and its size provides the prediction variance. The network prediction is smooth as the random noise is filtered out. The network has become overall more optimistic after the relatively stable week of staying above 4000$. It expects a rollercoaster ride up to the 4200$ levels within the next two weeks. The network still expects a major correction downwards within the month, but the medium term outlook has improved a lot. Since the network is pessimistic for the week, the strategy remains holding fiat with a 0.5% interest. This post is not financial advice! I am testing the potential to use neural networks for price predictions and am documenting my results on the blockchain to have provable public results. All prices are based on 0:00 UTC for consistency!